Who is ready for another week of the One Room Challenge?! In case you missed the first week, you can get the scoop here. 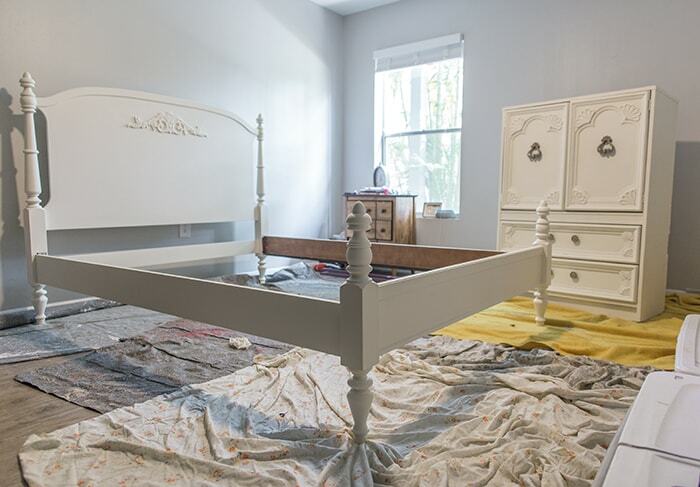 I’d love to show you a bedroom that is 1/6th of the way to a big, beautiful reveal… but instead it’s a mess of paint products, tools and tarps—and we’ve been sleeping on a mattress on the living room floor with our confused cat for 4 nights. 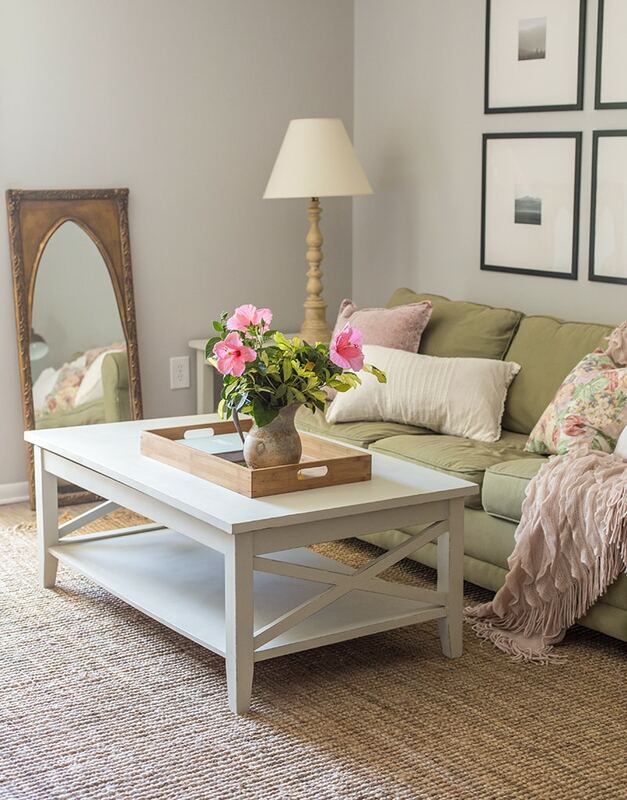 Speaking of, did you catch our Spring Home Tour on Instagram? 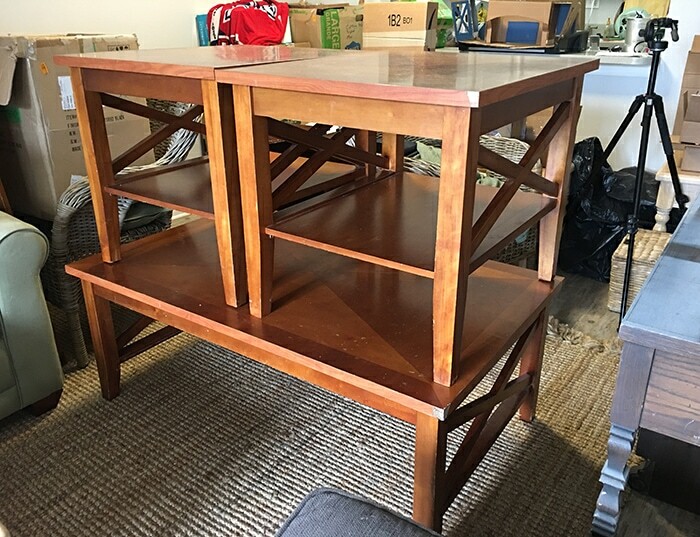 A $20 coffee and end table set (found on OfferUp) that had seen better days. The shelf on the coffee table was in need of repair, the wood was stained and the veneer had chipped off in several places. Nothing a little elbow grease couldn’t fix. We were doing everything by hand at this point (I finally found my Mouse sander in storage a few days later) so it was a long and arduous process. 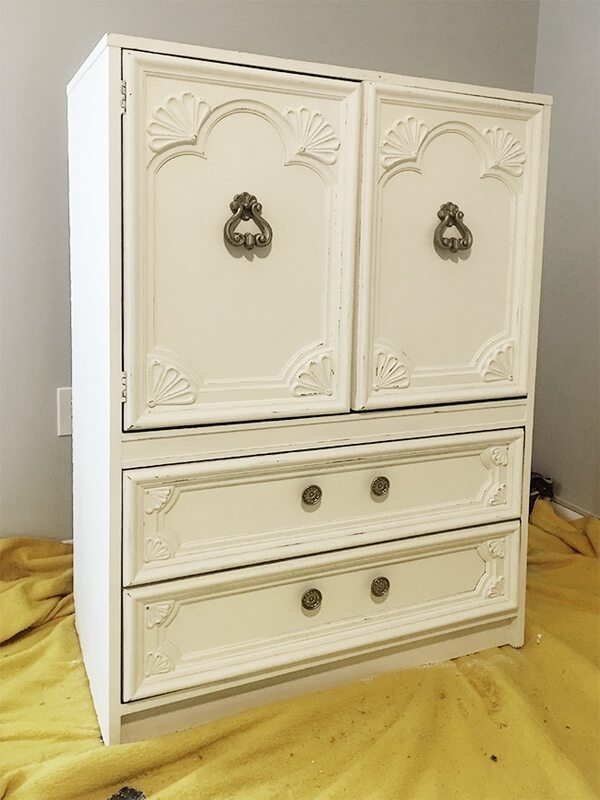 It has been a while since I’ve refinished a piece of furniture, so my skills were a little rusty. Between patching, sanding, painting, sanding, fixing some mistakes, repainting, sanding, waxing and then fixing more mistakes, it took us three solid days to complete this set. 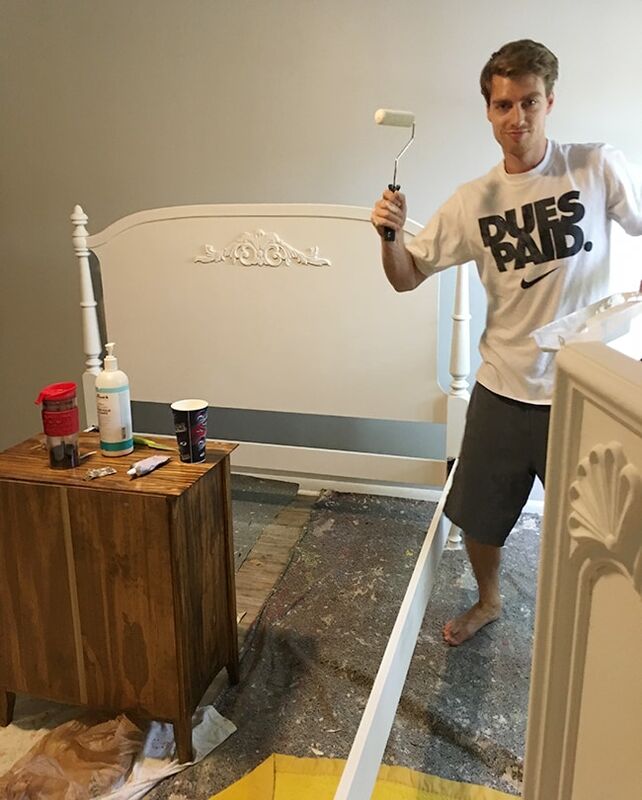 Fortunately, there’s no primer needed with this paint, so that saved us a huge step! Still not the encouraging first experience we were hoping for. By the end of it we were rethinking all of our choices to embark on this new venture, but we had an entire apartment filled with old furniture that had to go. Seeing this happy completed space was an instant mood lifter. It’s amazing how a little effort makes a huge impact on your overall well-being. This is why I do this. 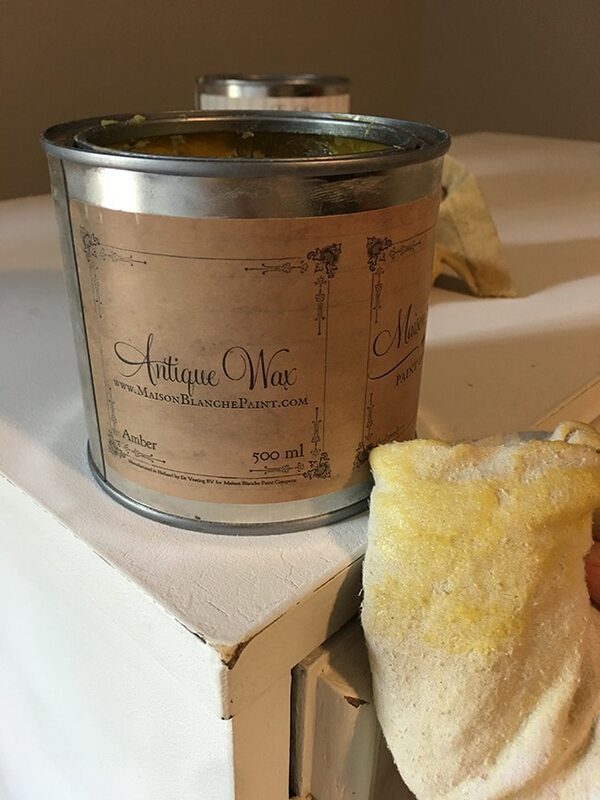 The pieces were painted in 3-4 coats of Maison Blanche La Bonne Terre (a soft white-grey putty shade), lightly distressed and sealed with Maison Blanche amber wax—PS, you can finally order Maison Blanche paints online! I listed the set on Facebook marketplace for $175 and was swarmed with messages—sold at full price within hours! 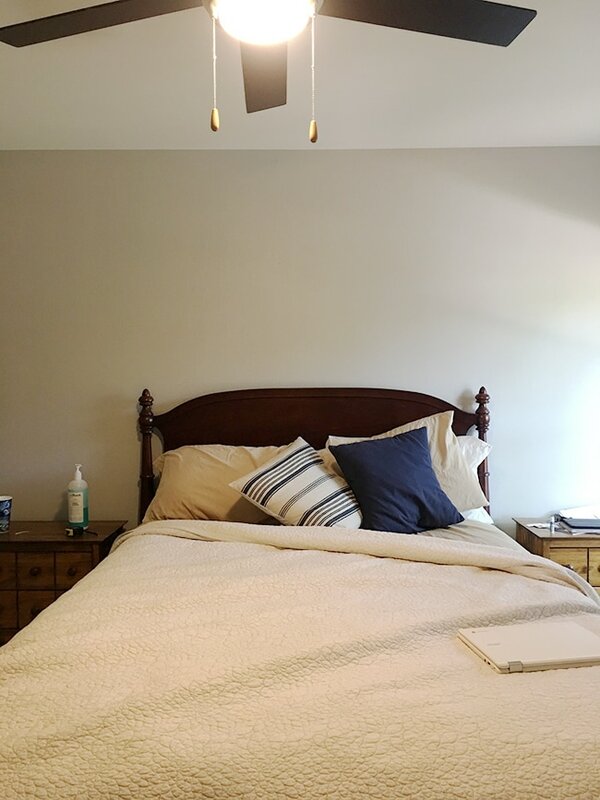 It’s amazing what well staged photos can do for a sale. With our hopes slightly deflated after the first experience, we started the weekend with a new attitude and a plan to tackle two more items in our bedroom. 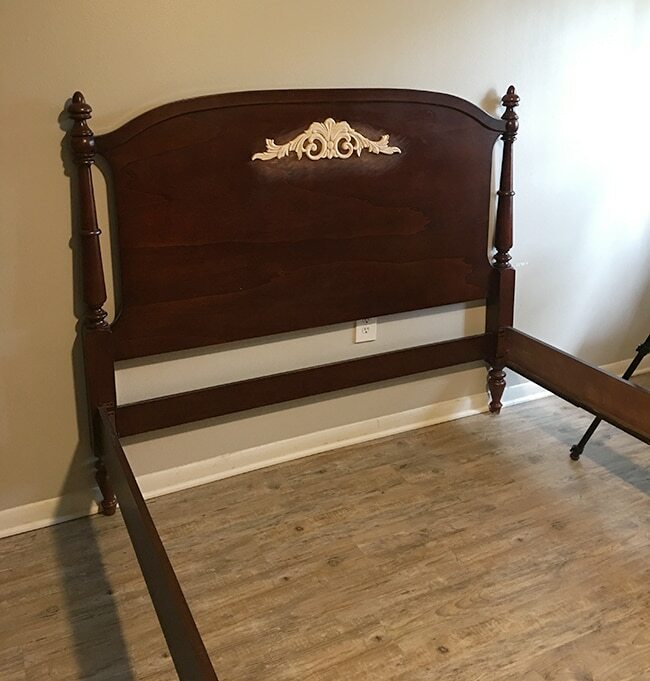 This bed was our first purchase after moving to Florida—we found it on Craigslist for $60 and paid another $60 to have it delivered. 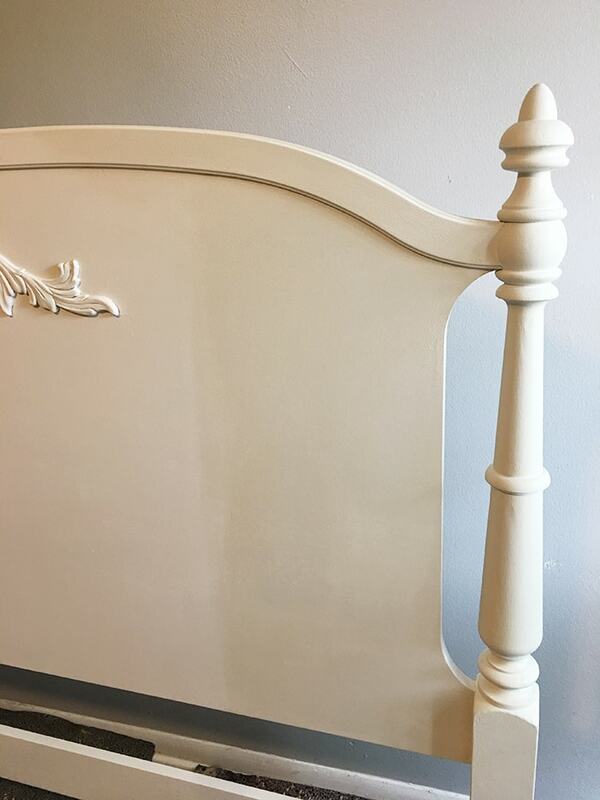 I just love the vintage charm and initially I had every intention on keeping it for the long haul, however 1) the new room design calls for something fabric and plush to break up all of the wood pieces, and 2) the frame is too long for our mattress so our pillows constantly fall behind it. As sad as I am to see this bed go, there’s plenty of other similar beds in the sea (I spot em all the time locally) and we have no room to store an extra bed, so I decided to let this one live its’ best life and get it back out in the world with a brand new look. 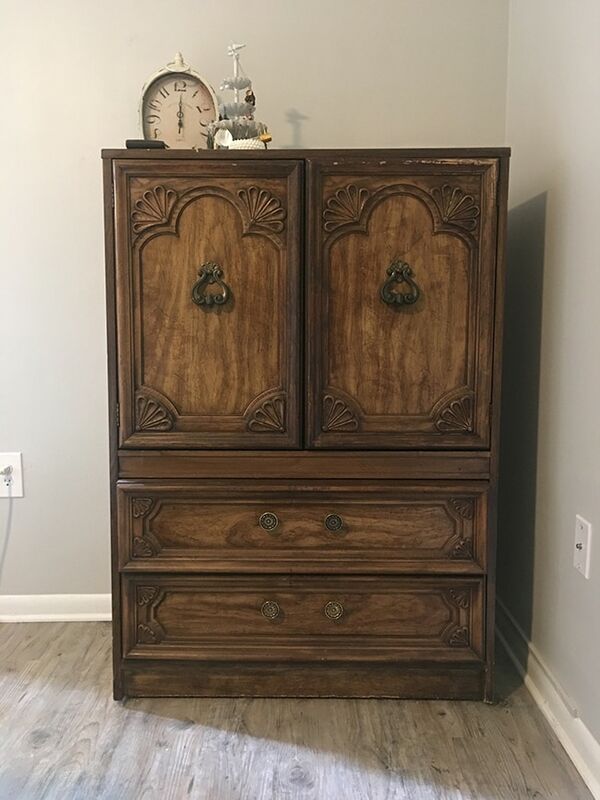 This wardrobe I picked up for $45 on OfferUp. I couldn’t resist that beautiful wood detailing. Don’t be fooled by its looks, though—it’s actually cheap veneer and particleboard that’s falling apart in the back. But the front is irresistible and I wanted to make her shine. 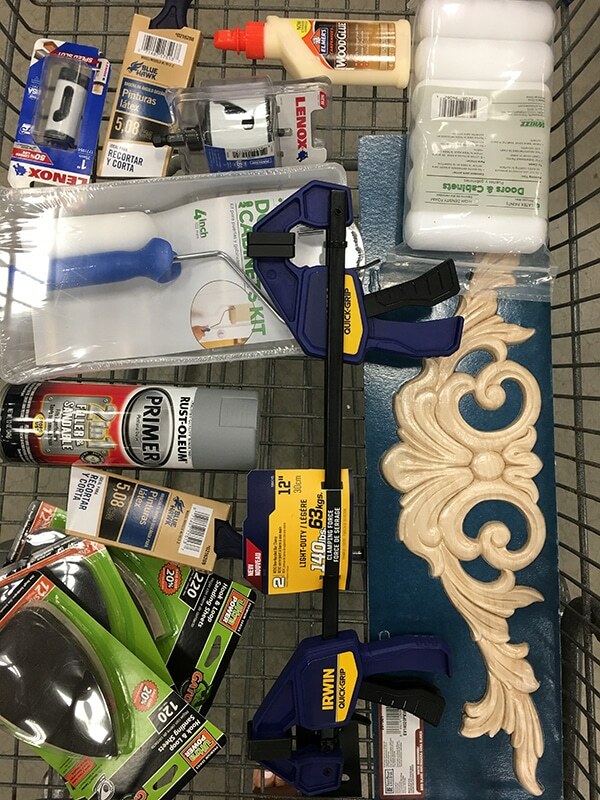 Before getting started, we made a trip to Lowe’s to stock up on a few essentials. Super easy! And with that, it was time to start painting. 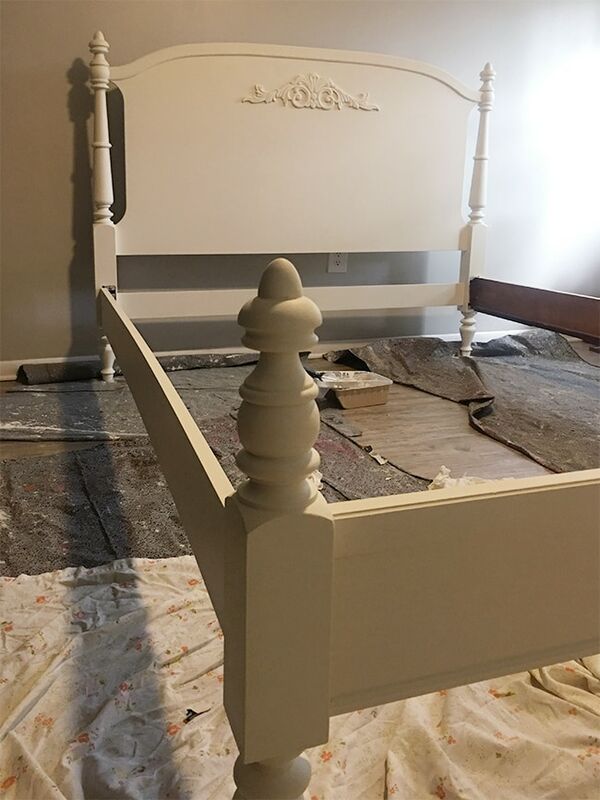 The bed was in great shape and didn’t need any patching, and there is no priming or sanding required with Maison Blanche paint (talk about a time saver!) 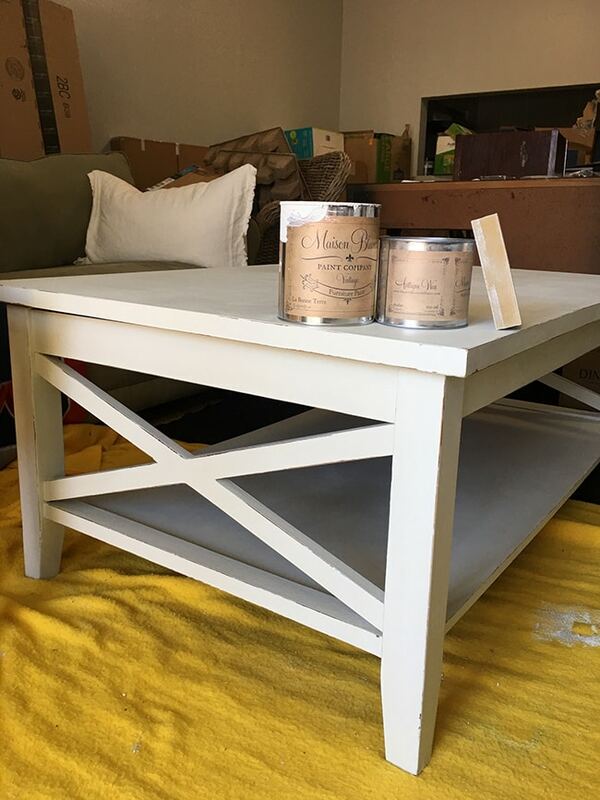 Honestly if I was using latex paint and had to prime and sand all of the furniture—I’d never do it, it’s just not worth the effort! Lucas and I figured this would take all weekend and be as exhausting as the coffee table set, but this time it was actually enjoyable. Maybe our expectations were curbed? Or perhaps it was the lack of patching all the wood holes & trying to sand them smooth by hand? Either way, we finished painting both pieces entirely on Day 1! 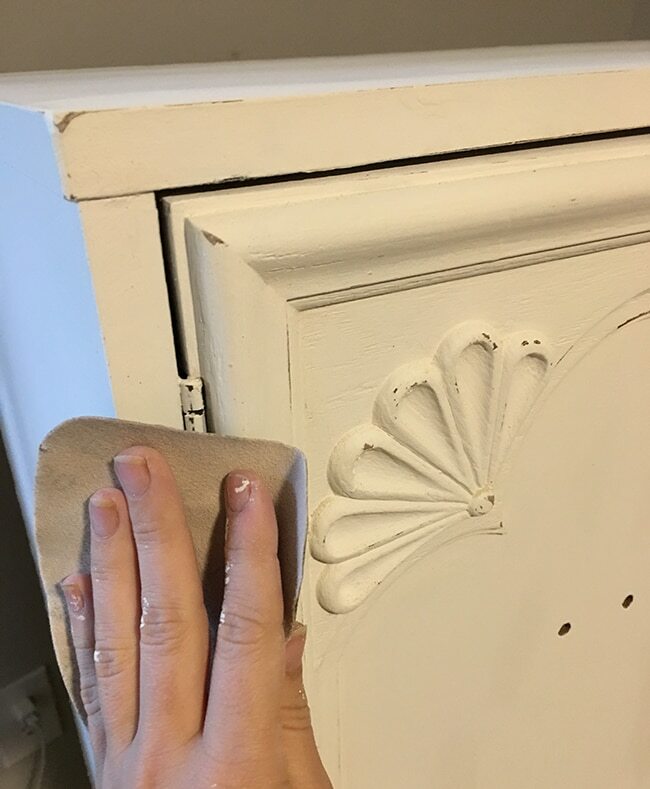 The best way I’ve found to paint furniture is to use the foam roller on the flat surfaces (basically anywhere it will fit) and come in with the brush to reach all the uneven crevices (like the spindles and around the applique). The surface of this piece is veneer that had some staining, bubbling and cracking. I spent a few minutes giving it a light sanding in some of the rougher areas to minimize the texture a bit. 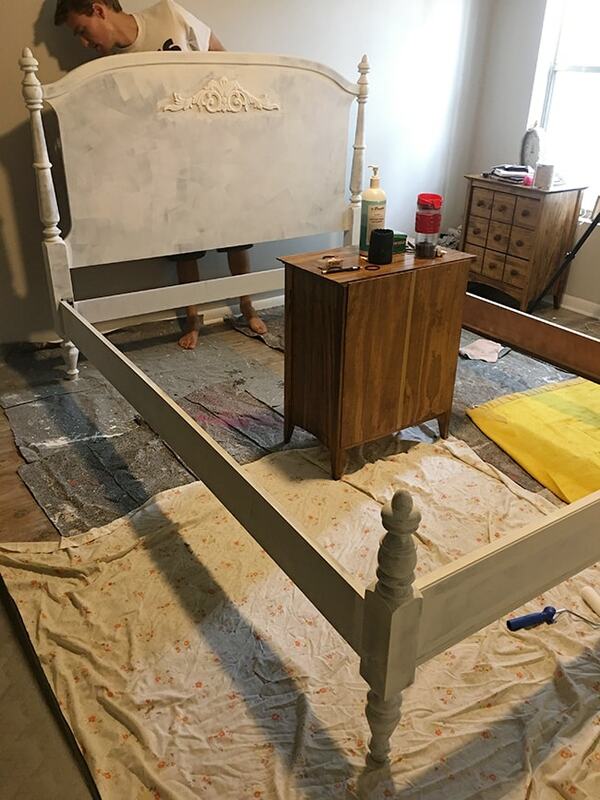 Very different surface than the bed, but it took the paint just the same. The goal is to get a nice and even coat, and we let it dry for a couple hours in between. Before adding the next coat, I came in with a 220 grit sanding block and lightly went over the surface to eliminate any imperfections/dirt/fuzzies left behind from the roller. This makes the paint velvety smooth and sets it up nicely for the next round. We gave the furniture one final pass to make our touchups, and we were done before dusk! Now onto Phase 2—time to decide how to finish off the look. A gentle hand sanding with 120 grit paper does the job. I tried to create an even overall wear throughout the piece so it looked naturally worn over time. SO PRETTY. I just love it. The bed on the other hand… I was on the fence. 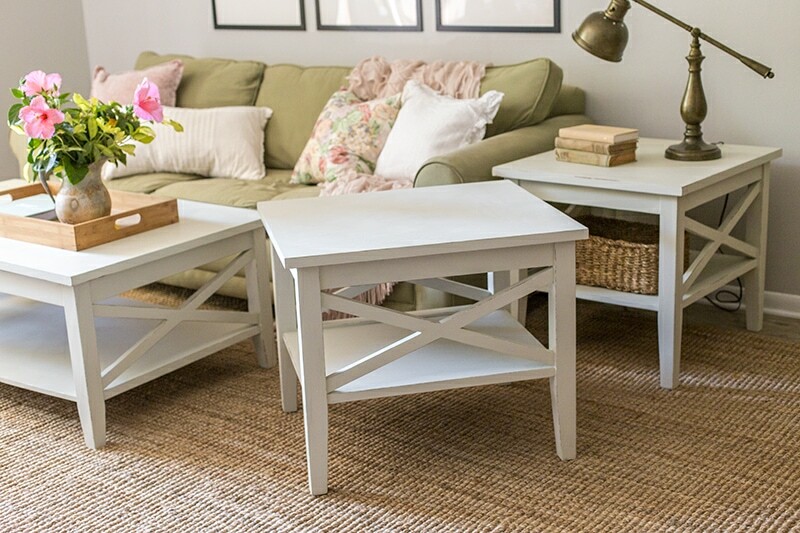 I normally lean towards adding some kind of distressing, because I prefer those “imperfect” pieces—who wants to constantly worry about accidentally scratching their painted furniture? Let’s just embrace it, right? But in the end, I will be selling this bed and I realize that some people prefer a cleaner look. Plus, they can always go back and add distressing later. I gave the furniture two thick-ish coats (no buffing it out, just letting it dry in between the two coats). It will need to dry and cure for a while before subjecting it to use—I like to wait at least a few days. 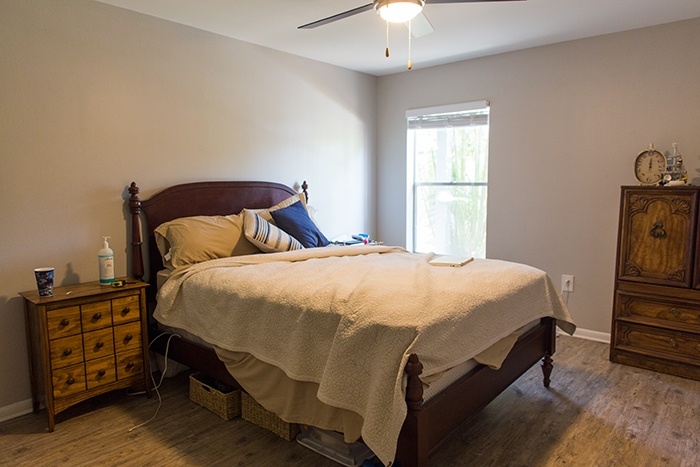 Honest opinions here—how much do you think the bed is worth? 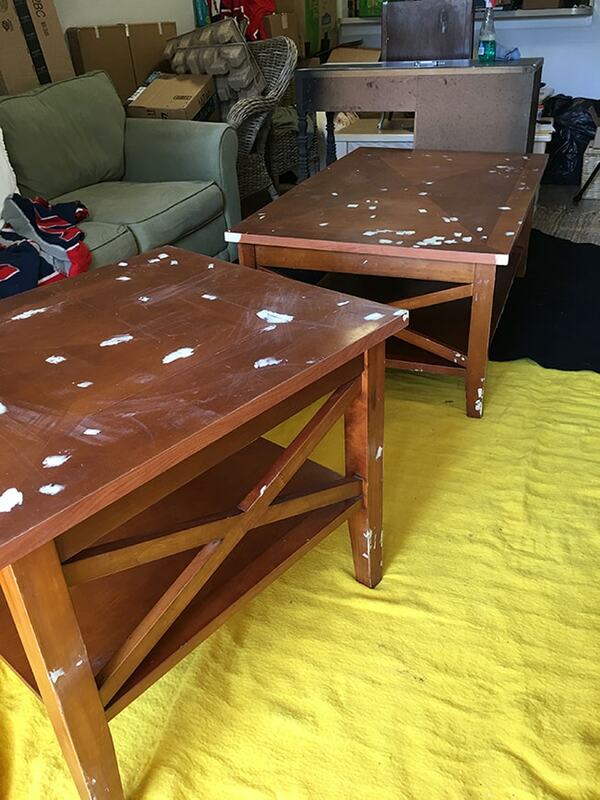 I thought I priced the coffee table set high at $175 but I had people fighting over it within hours, so I guess I need to raise my prices. For the bed I’m now thinking somewhere in the $300-$400 range. Let me know your thoughts below! Now head off to the other participants to see how their week went! Gorgeous…both pieces! You deserve top dollar for the furniture. 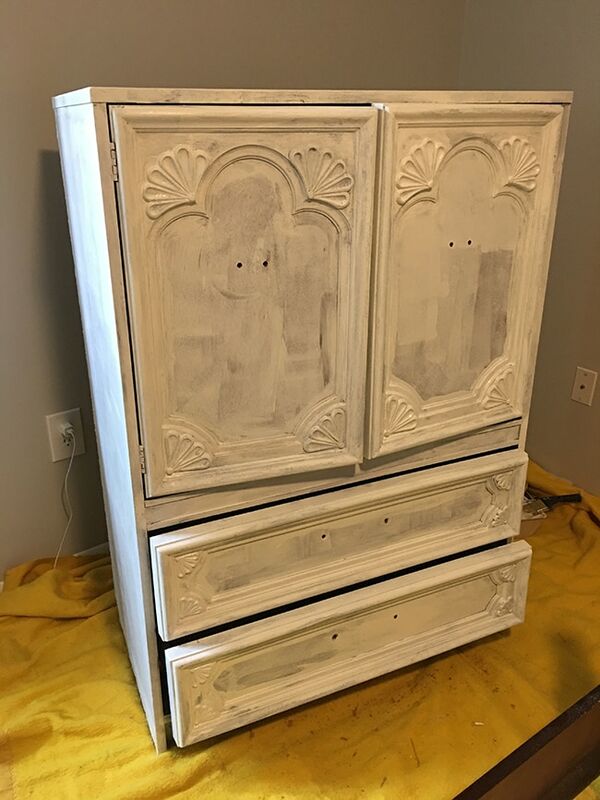 The paint is expensive and not everyone gets to use a one-of-a-kind piece of furniture painted by a very talented couple! Already looking forward to seeing your update next week! Agreed! You could even change $1000 for the bed. It’s so pretty! Thanks Michelle! 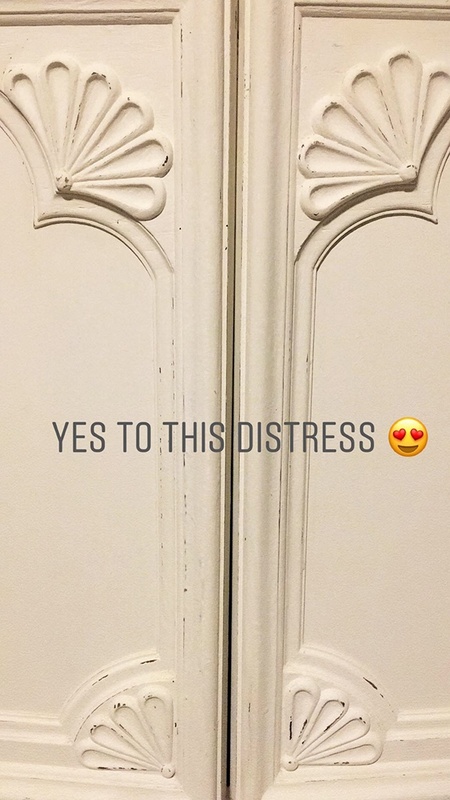 There’s not a ton of work to do in the space since unfortunately we can’t make any permanent changes but I am using the armoire as part of the challenge, so it’s really just furniture DIY’s for now until we can start moving everything into the room! This time around, why not go for your higher price first? May as well test your market and see if the endeavor remains worth it. Sure makes for entertaining blog content! Loving it! Wow! You’ve done sooooo many DIYs! what an inspiration. I say price it high and let people come in with a slightly lower offer! All the pieces you’ve done look great. You guys are doing a great job of turning lemons into lemonade given the situation with the Heights House. I’m agreeing with the others…price it high…you can always come down. It’s so wonderful to see you doing projects again!! Love it! 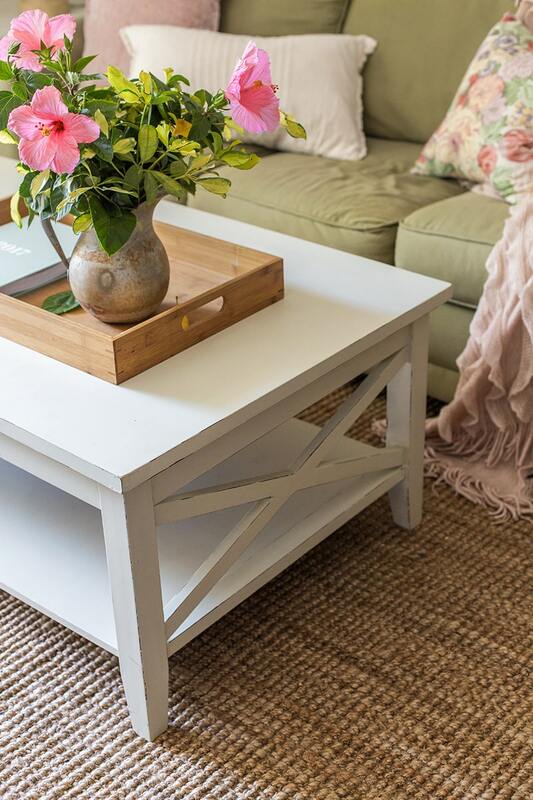 Love these furniture flips and the helpful tips!! Agree, go for high and see! They look great, love the inspiration! If I’m being honest, I personally wouldn’t pay more than $100-$125 for the bed. I can buy a new, factory finished, bee like that for a bit more. Not used and hand painted. Well this bed is much more unique than a factory finished bed. 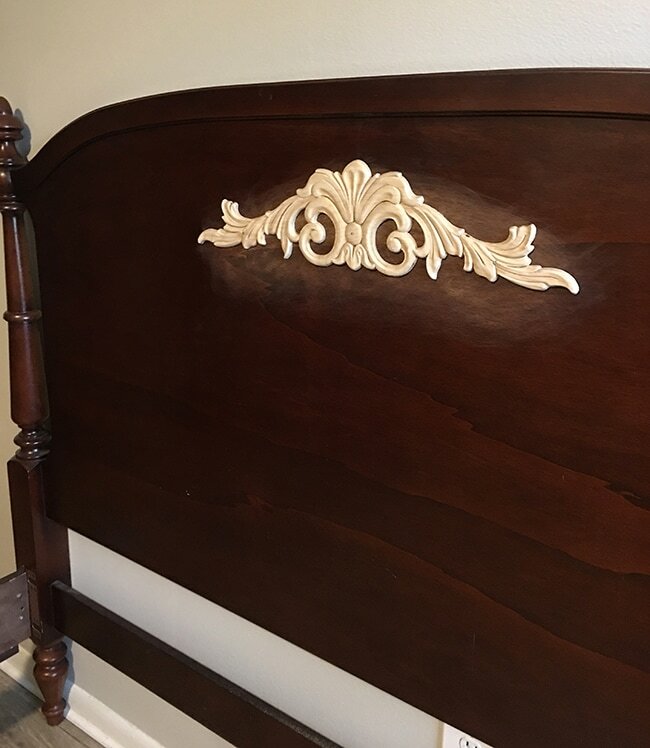 Hand painted “artisan” finish would demand a much higher price than a factory finish in the right market or home decor store. Obviously not everyone has the same taste. Jenna it’s beautiful and also my favorite part of any room or home project. 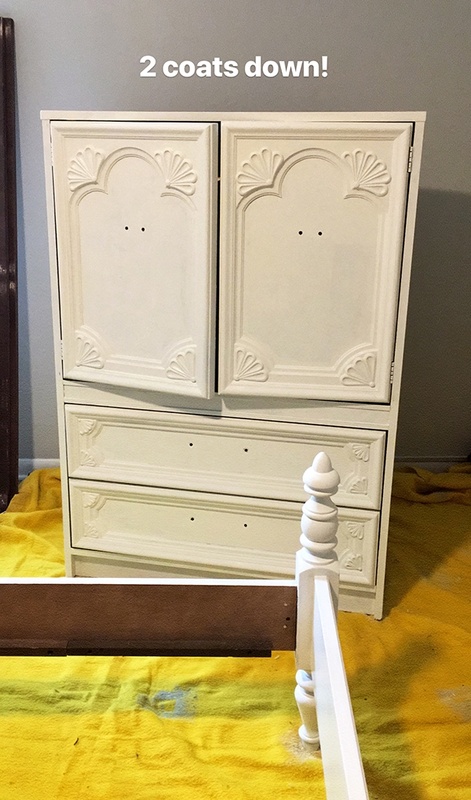 Furniture makeovers. So much more enjoyable then buying a piece new that’s factory finished. It’s about the journey…. Can’t wait to see your next house flip! Your work has been so inspirational. Appreciate the kind words, Ann! 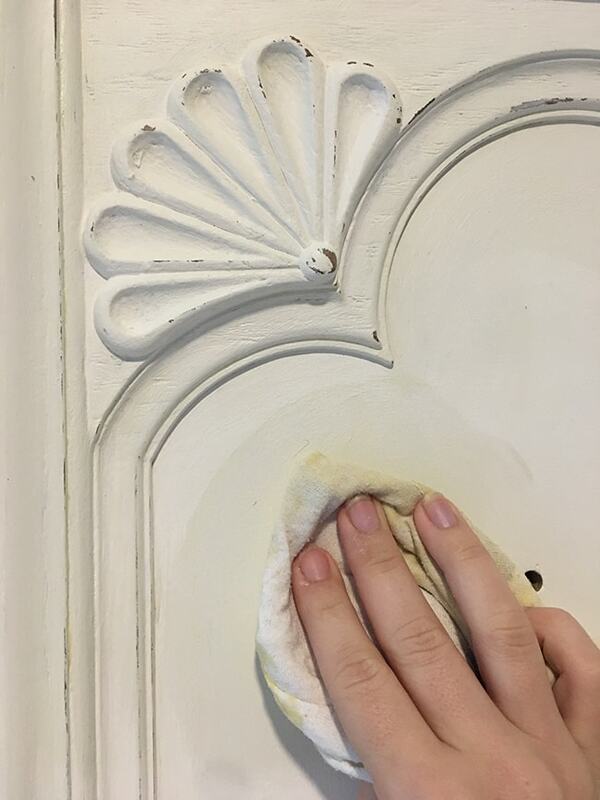 It really is such a nice feeling to have hand painted furniture that you’ve worked hard on in the house! I have a friend that did furniture flips and sold them in her own store (she painted in the back room between customer visits!). A bed like that would have been $400-500 here. It’s not a lucrative business though… she did okay because she made connections with local thrift stores that would deeply discount or just give her items that weren’t sellable for them. Between buying the items, supplies, and labour she wasn’t making a huge profit. But it was a fun adventure for a while and one she looks on fondly. Yeah, I think you really just have to enjoy painting furniture for it to be worthwhile!